I’ve been getting so many questions about my skincare routine that I follow and if I have any products I specifically love. On our long flight over to Hawaii I had a freshly cleansed face and as soon and I got on the plane I did my in-flight regiment (which I think is so important) on long flights I always follow this!! Did you know that only 20% of skin aging is genetic? The other 80% is caused by daily wear like pollution, stress, fatigue and more!? When my esthetician told me this I was so surprised. I thought it would be the other way around! This just proved how important the products I choose to protect my skin are! This year I will be traveling frequently for work and I actually discovered a product last year that I fell in love with and that I use every single time I get on a flight- especially a long one! It’s called Mineral 89 by Vichy. When I found out that 9/10 flight attendants recommend Mineral 89 and 7/10 can’t live without it in their daily routine, I knew why I loved it so much for when I fly. That just proves to me that it works as well as I thought! There are so many factors that have a big impact on your skin when traveling like air conditioning on the plane, and the cabin pressure. 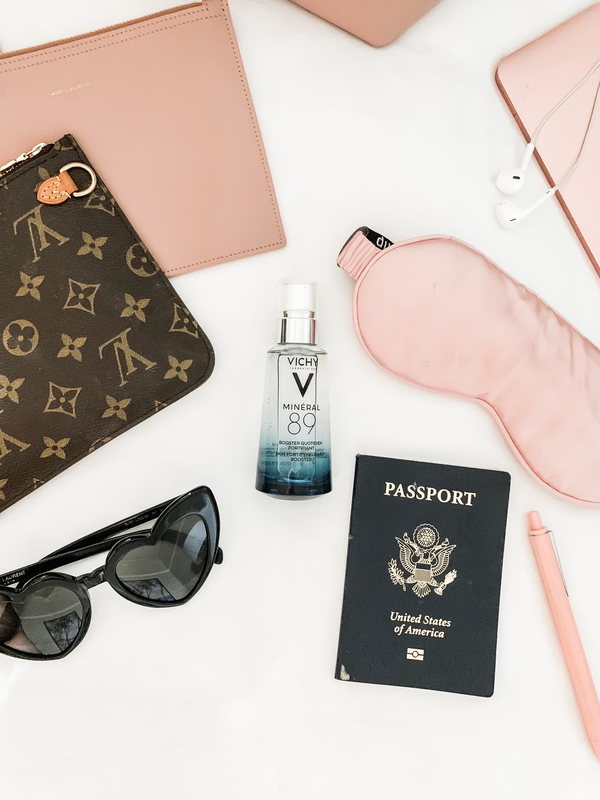 I get on my flight with a cleansed face and in my carry-on I bring my hyaluronic acid moisturizer by Vichy and apply before take-off to keep my skin ultra hydrated, and end with a lip balm and drink a full bottle of water. 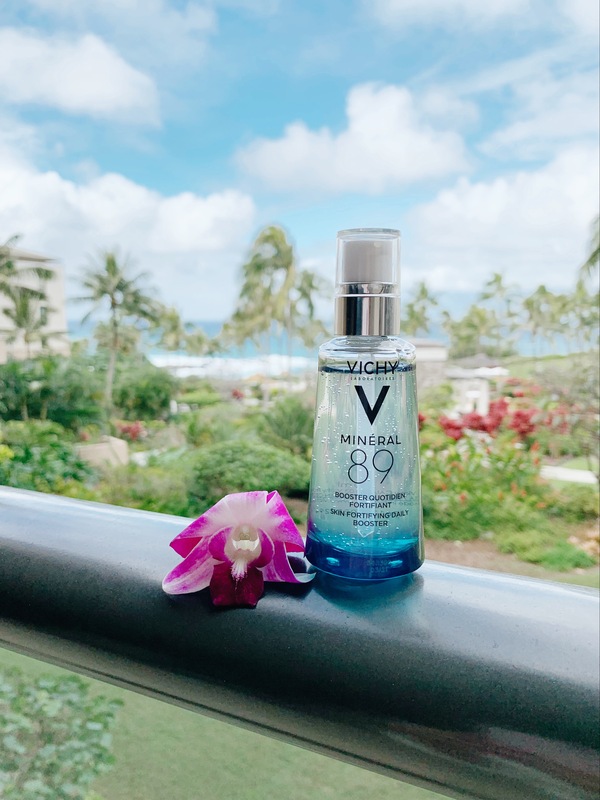 My skin can freak out on flights so I never wear makeup on them and I always use an ultra hydrating product that is going to keep my skin fresh, protected and glowing and Mineral 89 has been hands down my favorite product for this!! 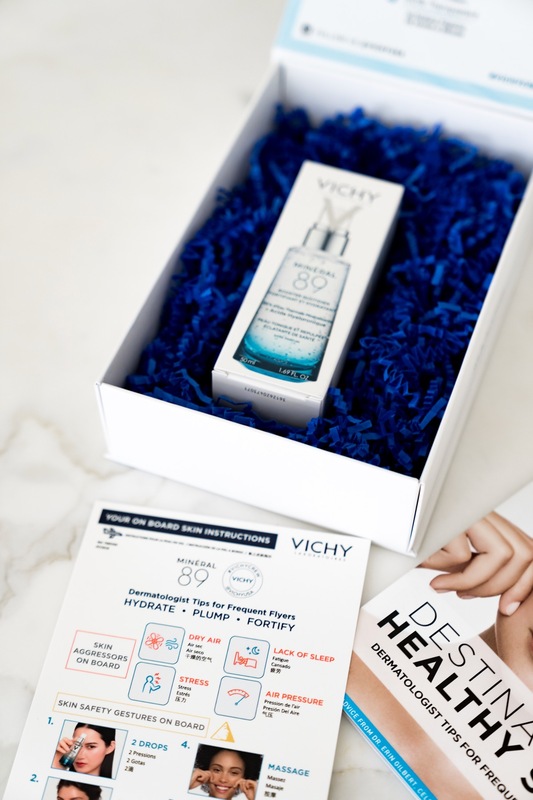 89% of the formula is Vichy Mineralizing Thermal Water (a key ingredient in all of their products) that is rich in 15 minerals clinically proven to protect your skin from the daily aggressors we spoke about before. 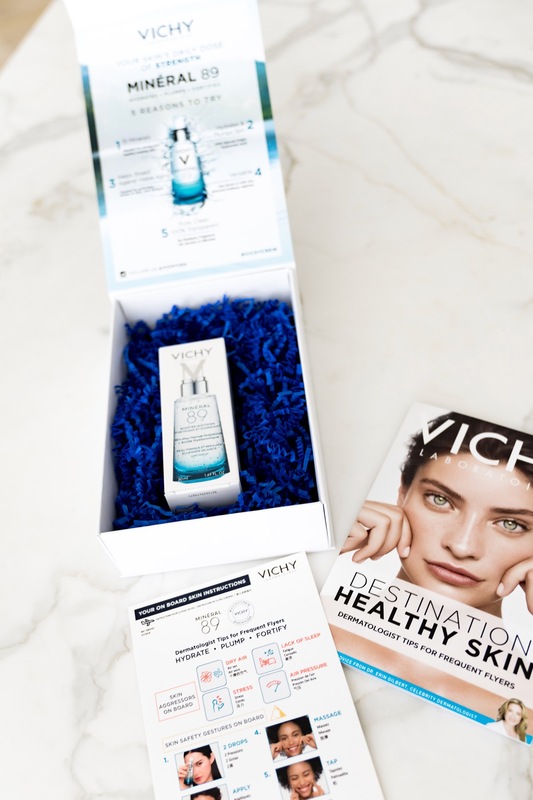 The exclusive Vichy Mineralizing Thermal Water is combined with natural-origin hyaluronic acid to plump, hydrate and fortify your skin. Also, only has a total of 11 ingredients which is amazing! I hate it when products are full of parabens, silicones, and oils, which this product does not contain. If you want to try it out, it’s $29.50 on vichyusa.com. I would recommend to put it on after you cleanse and I also love to use it underneath my make-up. It’s a barrier between my face and my foundation. Let me know if you guys try it or if any of you have tried it since I last talked about it!! Love ♥️ the pink travel tote bag. Simply beautiful! Love your style and your blog. I’m wondering where you are getting the 9/10 Flight attendant statistic? I fly for an airline and neither myself or my friends use this product, nor have we heard of it. Just curious, Thank you. I love your blog! I’m so hapPy i found you! Thank yOu for sharing about this moisturizer. I’m going to try it. I love yOur makeup and nail colors. Would you please tell me what brand and colors yOu are wearing? Your “look” is so peRfect for a Hawaiian vacation. I live in San Diego and would love to have the same Makeup and Nail look for everyday. Thank you! Great post! who makes the laptop case?? Senreve! It’s called the Envelope Clutch. 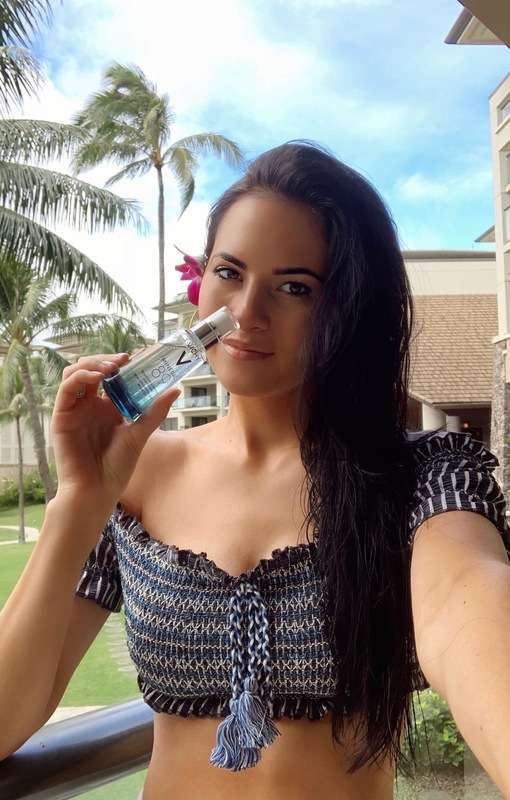 Loved following along on your Hawaiian adventure! I’ve actually been using Mineral 89 recently and love it, I really feel like my skin just looks more refreshed when I use it, got my sister hooked on it too!